Thirty years ago President Ronald Reagan called upon the leader of the Soviet Union, Mikhail Gorbachev, to “tear down this wall”. He was, of course, referring to the Berlin Wall which had divided West and East Berlin for almost a quarter of a century. Now we are hearing President Trump boast and brag about building a wall between the United States and Mexico. A big one, a high one (in Trump language, the biggest, the highest). What will that wall do? It will protect our borders, keep out the slime, the terrorists, the drug dealers, the people swarming over the border to take American jobs. And not only will there be a wall, but Mexico will pay for it! Just one thing, a small detail which you might not know if you haven’t visited the area: there’s already a wall. But before going into that, a personal reflection: Part of my family lives in Tucson, Arizona. For years, every Christmas we would jump in a car and drive south to Nogales, Arizona, then cross over to Nogales, Mexico on the other side of the border. I don’t know who started it but we all loved that trip which became a ritual. We couldn’t go to Tucson without going to Nogales. We would try out our awful Spanish, amble around the colourful market, buy Mexican Christmas tree decorations and Mexican handiwork to offer as gifts , savor spicy enchiladas or tacos for lunch and drink a couple of Margaritas before piling back into the car and driving back through the desert north to Tucson. We were hardly alone – that place was jumping with gringos like us down there for the day. The Mexicans were happy because we bought their stuff and we were happy because we bought it. What’s not to like? In the first years we went there, a chain link separated the two countries. We barely noticed it. Then one year we went on our usual outing and from a distance espied a high, rusty-looking metal fence. It was unsightly and offensive; it divided the two Nogales’s in two as definitively and repulsively as the chain link never had. We had to park the car, then stand in a long line of people to get our papers checked before we were allowed to enter Mexico. It made our excursion a lot less fun. Come to think of it, I’ve never returned to Nogales since. Well, if it was less fun for we Americans who wanted to get in, you can only imagine what it was for those Mexicans who, for whatever reason, wanted to get out. We headed back in our comfortable air conditioned car while they left everything behind, climbed or circumvented the wall and with only their feet to propel them, started on a perilous adventure. You have to be brave or desperate to embark on a journey across forbidding land under a blazing sun with the risk of running out of water or getting arrested by the border police who are there in droves. Many times as we traveled on the Tucson-Nogales road, I would look out the car window at that dry and desolate and beautiful desert and think of all those Mexicans crossing it. Many made it; many didn’t. (The U.S. Border Patrol has found 6000 human remains, a figure not often mentioned in all the talk about the border). The wall, Mr. Trump, is already there in many places along the border. Why build more walls, higher walls? Walls are ugly, divisive and basically useless, the concrete manifestation of a nasty mind set. 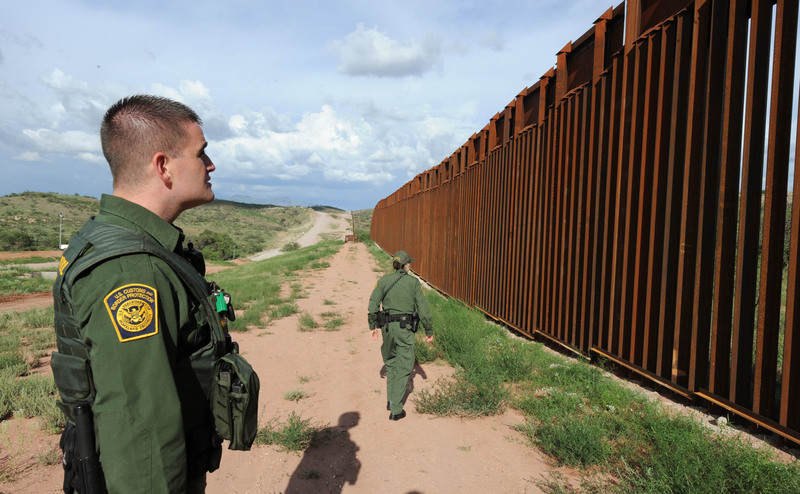 No, Mr. Trump: don’t build more walls. Tear down this wall! “Yes,” he huffed, looking at my uncomprehending face. “France is not an American colony.” And having delivered his parting shot, off he went, leaving me stupefied. 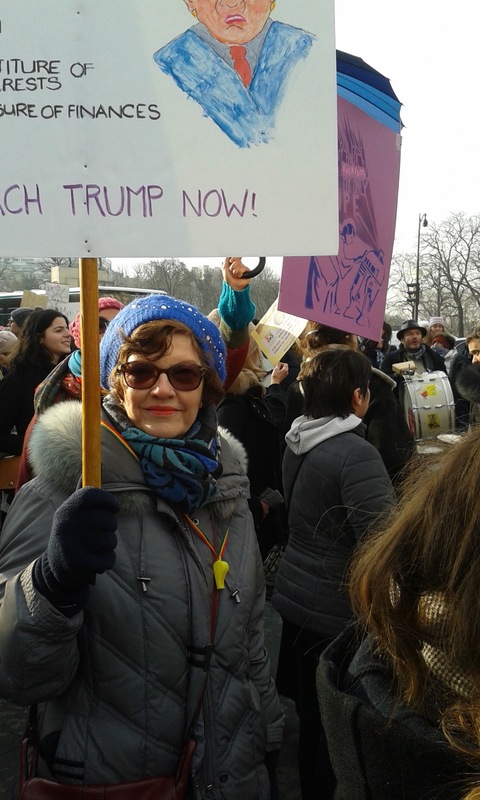 It was obvious, at least to me, that since the protest was about Trump and since most of the participants were Americans, the posters would be in English. Non? But the fellow’s comment got me thinking: Am I a nasty American imperialist, one of those people who doesn’t give a fig about the country she is in? You know the kind of people I’m talking about. They are the ones who wouldn’t consider learning the French or Spanish or Italian word for “hello” or “thank you” when in France, Spain or Italy. They figure that everyone in the world speaks – or should speak – English just like them. This being said, as far as the Paris march is concerned, I can understand why the majority of posters were in English. Many of the American participants were visiting Paris, passing through. Others may live in France but don’t speak or write French for whatever reason. But what about people like me who live in France permanently and speak and write French with no problem? I had to ask myself why the thought of making a bilingual poster never even crossed my mind. The answer is simple: I figured it was an American protest against an American President. That’s basically true. 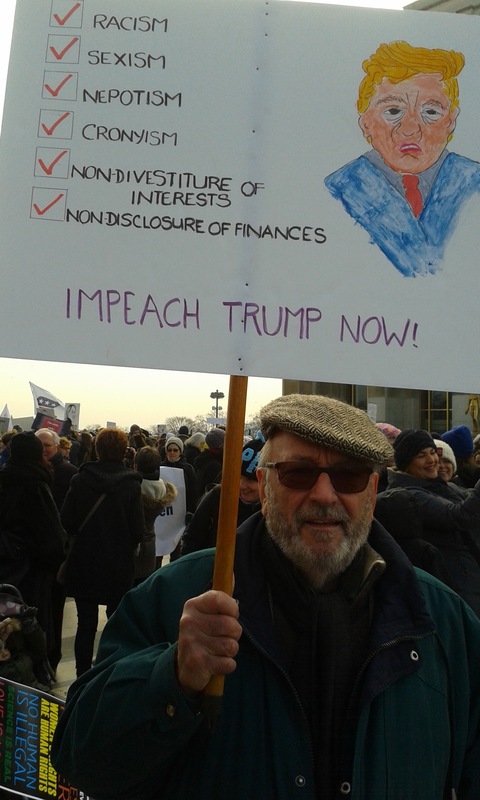 However, I didn’t take into account where I was – in France, walking down French streets, showing a poster that would be read not only by other Americans, but by the French who just happen to live in this country! The harm Trump can and will do affects the entire world, including the French. They too are the victims of this election. So they should at least be able to read my sign! OK, I was culturally insensitive which is rather ironic for someone who has written three books on the subject of being culturally sensitive. A slap on the wrist to me! And a little reminder to all Americans abroad: keep in mind that a little courtoisie goes a long way. Now that we’ve got Trump, we need as many ambassadors on the ground as we can get. So, excusez-moi, Monsieur. La prochaine fois j’écrirai mon poster en français! (Excuse me, Sir. The next time I’ll write my poster in French!). This entry was posted in Uncategorized on January 22, 2017 by harriet.welty.